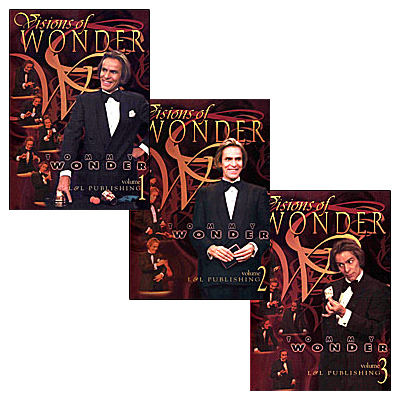 The amazing Tommy Wonder: All 3 volumes at an amazing discounted price! Amongst the pure gold, this also includes his famous two cup routine which will blow your mind! This product will add 3.82€ to your cashback account. Tommy Wonder is a living legend in magic. The routines, philosophy, creative process, and thinking detailed on Visions of Wonder are why he is hailed by his peers as one of the top performers and thinkers in magic and why many consider him one of the most important magicians of our time. These videos will demonstrate a master at work, a performer who so thoroughly understands magic and his audiences that he has people question whether they've seen the real thing. You will learn how to apply these lessons to your magic and thus make you a better magician. You will see how an audience can be devastated and deeply touched by a magic performance and you'll be inspired to bring your magic to a whole new level. If you have not seen Tommy Wonder, you are in for a treat-an experience like you've never had before. Even if you have seen Tommy Wonder, you are in for a treat. You will see new items never before taught, you will see the incredible routines you have only read about, and you will see and learn how to make audiences believe they have seen real magic. In addition, on all three volumes, Max Maven will guide you through some fascinating discussions with Tommy Wonder where you will get an insight into the psychology, thinking, and creative process that have made Tommy Wonder a living legend in magic. These videos are unlike any other project L&L has created. Not only is Tommy Wonder's magic unbelieveably brilliant, but the editing and candid behind-the-scenes footage take these videos to an entirely new level. That's a promise! What's more, there's a special treat - fifteen minutes of extra bonus footage on each volume. RUBIK'S CARD -Tommy shows a small box filled with blocks that have card pips on some of their sides. A card is selected and the lid is removed from the box to show that the blocks have somehow arranged themselves to form an image of the selected card. Tommy goes on to explain his workings on Cough DROP, vanishing bird cage, the boomerang card, the Zombie Ball, and his wonderful ring and rope routine. NEST OF BOXES - Tommy discusses in tremendous detail three unbelievable versions of the Borrowed Watch to Nest of Boxes. You will shake your head in disbelief and be absolutely dumbfounded. COINS ACROSS - A combination of the Coins Across plot, a coin box routine, and a wonderful Coin in Eye routine to close. This gets the same strong reaction of the Card On Forehead but with coins. Practical and incredibly strong. AMBITIOUS CARD PLUS RING BOX - See why a card trick gets standing ovations time after time. Tommy slowly builds and builds the impossibility of the classic Ambitious Card effect and ends with one of the best versions of the signed card to box plot in existence. Tommy also demonstrates his fabulous handlings for two classic effects-Card Through Handkerchief and Everywhere and Nowhere.